Today’s video is specifically for those, whose problem is how to download YouTube videos? 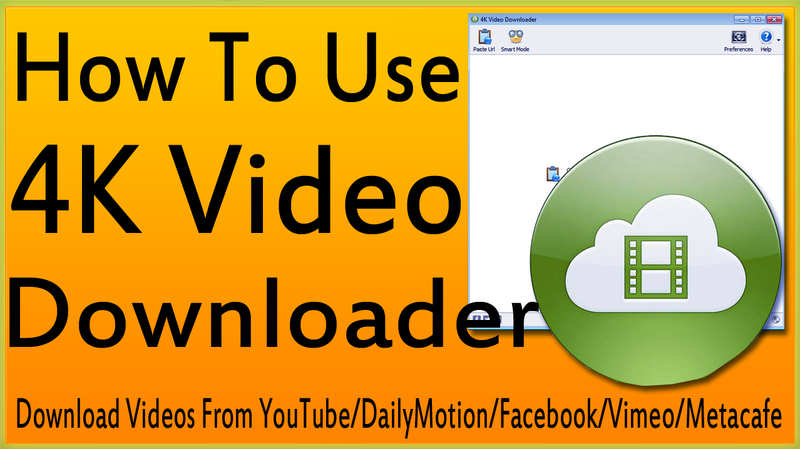 I’m going to introduce a very popular and effective video Downloader called 4K Video Downloader, In this 4K Video Downloader tutorial, You will learn How to use 4K Video Downloader to download videos from YouTube and other video sharing websites? I’ll try to cover all aspects of 4K Video Downloader in today’s video tutorial. Before proceeding furthermore, I would like to clarify a few things about 4K Video Downloader. 4K Video Downloader is one of those software that are called open source. Open source means everyone can use, edit its source code and even can design a new software using its source code as well. Although 4K Video Downloader is a free to use video Downloader But there is another thing that does not make any sense. On one side, 4kdownload.com calls 4K Video Downloader an open source piece of software and on the other side, They offer its paid version with a few additional features. It seems to be a bit odd. However, One of the great benefits of 4K Video Downloader is that this video Downloader is designed for Mac OS X, Linux and Microsoft Windows operating system users. There is one thing which 4K Video Downloader free version lacks. 4K Video Downloader free version does not allow downloading a whole YouTube channel and playlist along subtitles. As far as this question is concerned, that is it safe to use 4K Video Downloader? Neither I found any toolbar and unwanted program’s suggestion while installation process, nor my antivirus notified me about anything suspicious or harmful so far. As well as I have not felt any impact on overall speed and performance of my PC till now. But as a precautionary measure, I would like to suggest to download 4K Video Downloader from official website. After opening 4K Video Downloader up, You will see a very easy to use and straightforward interface. As you can see there are 4 buttons. Paste URL. Having copied, you can paste the url to download your desired video with a single click of your mouse. Then you will have to choose resolution size, video quality, output format and output folder where you will find downloaded video. As well as you can choose extract audio to download only audio not video. Smart Mode. In simple words, this will save you time. You can set everything at once and next time, you can download videos with one click as per your desired settings. Preferences button can be used to make your desired settings. Here you can also enable proxy. Help button contains text and video tutorial resources through which you can solve any problem regarding the software and ask for support. If you use 4K Video Downloader free version, you’ll see a button forcing you enter in a registration code to activate its paid version. I hope it’s all been helpful for you to understand user interface of 4K Video Downloader. Let’s download a video. Open YouTube and copy video URL from the address bar and get back to 4K Video Downloader. You simply need to press paste URL button and 4K Video Downloader will retrieve video details. Now all you need to do is that select preferred resolution size, output format ranging from MP4 to FLV, MKV, 3GP and output folder. If you want to download mere audio then you need to select extract audio from drop down menu. You can iterate same practice, If you want to download a whole YouTube channel and playlist. Smart mode is indeed a smart option in 4K Video Downloader and could save you time. How? Let’s suppose, You download videos to be watched on your high-end mobile phone and your favorite video format is MP4 with 480p resolution size and you want to get rid of doing all practice. You simply need to enable smart mode and make your favorite settings and rest of the job leave upon 4K Video Downloader. Next time whenever you will press paste URL button, 4K Video Downloader will follow your instructions and automatically begin downloading the video or extracting audio from video. So this was today’s video tutorial on How to use 4K Video Downloader to download video from YouTube and other video sharing websites? I hope you’ll find it helpful. In case, If I could not cover anything, then do let me using the comment section. I’ll try my level best to solve your problem. Stay tuned and stay blessed and do not forget to subscribe and like. How To Enable Group Policy Editor (gpedit.msc) In Windows 10 Home Edition?